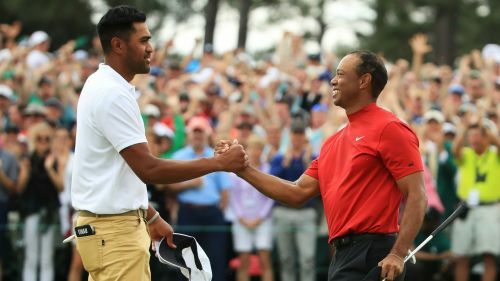 "I'll tell him I was there when Tiger won his 15th major in the final group," Finau said. "At that point, I'll hopefully have a few under my own belt. You can't say enough about Tiger and what he's done for the game. "It's great for him to be involved in the game and now he's got his 15th major. He's going to be a force to be reckoned with these next few years, I'm sure. "It was great. Not the ending that I wanted. But to witness that, a handful of years ago I don't know a lot of people believed that Tiger would win another major. From what I saw today obviously he's not going anywhere anytime soon and congrats to him on his 15th major. "For me it was fun being a part of the action. And it's a lot of fun to be in that type of atmosphere. It's what I practice for, what I play for, what I train for. My time is coming. I know it is. And I've just got to keep riding the storm." Molinari, who dropped two shots at the 12th hole and two more at the 15th having led at the start of the back nine, joked that he had "made a few new fans today with those double bogeys". When asked if he became a fan upon watching Woods' crowning moment, the Italian replied: "No. Sorry, but no, no. No, it was great to see, but, no, it's actually…you start losing a bit of adrenaline. "But it's nice to see his story, his comeback, and to be a witness in first person, it's nice. "It's great to see Tiger doing well but the way he was playing last year I think we all knew it was coming sooner or later. "So maybe next time it will be better for me, but it was nice to be out with him, he played well, he hit the right shots at the right time and deserved to win."